Inspector McKee's Mission began as a hunt for a suspect. Routine case--just a few questions. Nothing serious. But among the small group of passengers he was watching on the luxury train, he was to discover that "routine" can so easily become a homicide case. After all, you can't question a dead man, and McKee had a corpse on his hands. And a dozen questions. And a dozen candidates for the title: Murderer. McKee is Reilly's primary detective, after all, so one would naturally expect him to be right there on the spot for the entire book. Except he isn't. He's not on the train at all. He's back in New York for most of the novel. 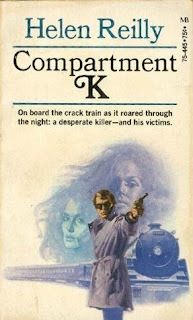 Detective Todhunter (who, if I've met him in one of the other McKee books, I don't remember at all) is on the train and follows the suspect/s into Canada. Todhunter assists the Canadian police in all the investigations that go on. Todhunter sends messages and talks on the phone with McKee. Todhunter doesn't really have a a forceful enough personality to take on the role as central detective. Neither do the Canadian officers. So, the investigation just sort of meanders its way along through most of the book. And McKee then shows up live and in person for the last two chapters. Just in time to put all the clues together and whip a solution out of them. So...what have we got? We've got Elizabeth Questing suddenly inviting her family and friends to her lodge up in Canada. It is anticipated that she has some sort of announcement to make. But what? The group includes her estranged sister-in-law, Loretta Pilgrim, and her daughter Candy with husband Daniel; her cousin Rose O'Hara and her fiance Nils; and her friend Colonel Eden. Also on the train are Elizabeth's man of business, Harry Belding and his wife Gertrude....and a surprise guest: Gil Davidson who also claims to be a distant cousin. Shadowing all of them is Detective Todhunter whose job it is to see what connection, if any, they might have to the an unknown woman who had been killed in the vicinity of Mrs. Questing's New York home. Before Todhunter can make much headway on that assignment, murder strikes aboard the train...with Davidson as the victim. It isn't until the murderer strikes once more--up at the lodge--and many secrets are revealed that enough clues will be gathered to reveal the guilty party. Stolen jewels, secret marriages, a bit of blackmail, and the fate of the Questing fortune will all play a part in the grand finale. We also have Rose O'Hara playing the part of the standard heroine in danger. Rose goes about covering up for her former fiance, Daniel; estranging herself from her current fiance, Nils; seeing motives everywhere and fearing everyone; working herself up into a general state of hysteria repeatedly.....and, quite frankly, being incredibly stupid. I wanted to shake her several times and tell her to get a grip. And, of course, she does have to do the "I just remembered something important" bit and then wander off and get herself clobbered. But--being our central character--she escapes death and lives to help finally identify the culprit. This was a rather pedestrian offering on the part of Reilly. Perhaps it was the lack of McKee or perhaps it was the feeling that she had loaded the story with so many of the standard trappings: heroine in danger; surprise relatives; secret marriages; a bit of blackmail; and all that melodramatic suspense (generated by the heroine in danger)--I'm not certain. But the book definitely felt a little flat and not up to Reilly's usual standard. Two and a half stars. Todhunter is definitley in the McKee of Center Street series. He was one of the more interesting policeman in MURDER IN SHINBONE ALLEY and had some of the best scenes when McKee was "offstage." I talked about him in my review of that book earlier this year. @John (hanging head in shame) I must have missed that review...or Todhunter. It sounds like he makes a better showing in SHINBONE ALLEY than he did here. He comes off in this one as "that little gray detective." Well, he is described as mousey in SHINBONE ALLEY. But I also rememer he was able to transform himself in a Cleek-like manner by "becoming" another person.